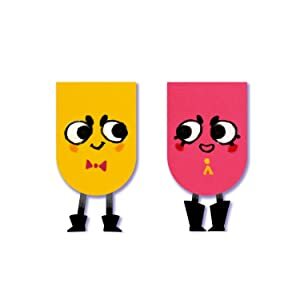 Paper pals Snip and Clip must cut each other into the right shapes to overcome tricky obstacles in this updated version of the game. Partner up with friends or family to solve puzzles, including new comic book and toy box worlds, and more! Plus, play the original levels in new shapes! No matter how you cut it, this couch co-op is a riot! Snip may need to cut Clip into a needle to pop balloons or maybe you'll have to team up to form a squawking, egg-laying bird! Prove you're a cut above the rest in Blitz mode, where 2-4 players can compete in a series of puzzlingly action-packed challenges. Make it a party with Party mode, where up to four players can team up to solve fun puzzles. Additional accessories may be required for multiplayer mode. Sold separately. Laugh-out-loud couch co-op, any way you cut it! Hey, cut it out! No, really! 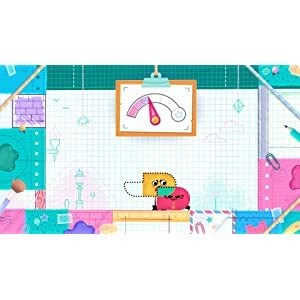 In this action-puzzle game, paper pals Snip and Clip must cut each other up to overcome tricky obstacles…or just to laugh their heads off (sometimes literally). Partner up with friends or family to cut the heroes into the right shapes, interact with objects, and solve a world of imaginative puzzles. Someone grab a paper weight—these puzzles just won't stay still! The only limitation to solve puzzles is your imagination. Snip may need to cut Clip into a needle to pop balloons, or maybe they'll have to team up to form a squawking, egg-laying bird! When playing together, prove you're a cut above the rest in Blitz mode, where 2-4 players* can compete in a series of puzzlingly action-packed challenges. Three is never a crowd when you're paper thin, so make it a party! In Party mode, up to four players* can team up to solve tough challenges. Ready or not, this couch co-op is a riot, any way you cut it! Big plus for having 1-2, 1-4 and 2-4 player modes. 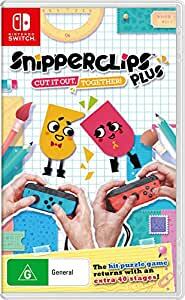 It's a cute game where you "snip" and "clip" the other player so they can fit into certain shapes, reach places and solve puzzles. All accompanied by nice music and cute sounds (and rumble). Using just the 2 joycons, you can attempt to work together with a friend and complete the challenges, but you will often find yourself just munching each other and having a giggle fest. For solo play, I can't comment but with a friend or partner, 10/10 fun. This game is a lot of fun with friends or family. As you have to solve a number of puzzles by working together it involves a lot of communication and doesn't take an experienced gamer to be able to play. My girlfriend and I didn't finish it all yet but it seems like it wouldn't take that long to complete so it may be best to wait for a sale to pick this one up. Probably boring as a solo game, but multiplayer is fun and hilarious! Some of the later levels offer a decent challenge, the game is a good size for the price. Highly recommended. 4.0 out of 5 starsFun game. A fun little time-waster to play with friends. Single player is satisfactory, but nothing to write home about. I think it's definitely worth the time and money provided you have someone to play with. Really simple game, but really simple fun too with a friend. Worth the purchase.